I have decided to start a new series of posts called "My Favorite Places." Since it is Halloween I thought I would start out with some of my favorite places that are said to be haunted. 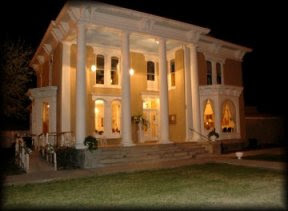 First -- The Luna Mansion, located in Los Lunas, New Mexico. The structure you see in the photo was built around 1880 and not at all in New Mexico style, but in a southern style. It is said to be built in that style because the Luna family had made many trips to the south and feel in love with that style of house. The family didn't actually build that house, they forced the railroad to build it for them. The railroad wanted to put tracks across part of their land and so they made a deal that they would allow that if the railroad built them a house to their specifications. A much smarter deal than just having the railroad pay them money and building the house themselves because the railroad had to endure all the hassles of acquiring workers and the right building materials. The house is no longer a residential home and instead is a very good (and fairly expensive) restaurant. The house is said to be haunted by Josefita "Pepe" Otero, who was one of the original family members. There also seems to be various other ghosts that make their presence known from time to time. I can say for certain that Luna Mansion is my very favorite place in Los Lunas and one of my favorite restaurants in New Mexico. Not just because the food it good, or because of the rumored ghosts, but those things along with the history of that beautiful house. If Pepe does haunt the house, she seems to be a very content ghost. I have never felt anything but good vibes at the Luna Mansion. I must say…. It's a lovely house.